Something new is bubbling up within an old bottling plant in south Minneapolis. The new high school will include open spaces for students, as well as a new lecture hall, dance studio, and learning spaces. the school, according to Hiawatha Founding Principal Nicole Cooley. “I think that this is going to be an interesting bridge for what high school looks like and what college looks like,” Cooley said. is to close the opportunity gap in Minneapolis by providing resources to help every student succeed, graduate and go to college. than 80 staff in the next four years. to a Star Tribune report, but high demand from families accelerated the plans. The current high school opened in fall 2015 in a smaller building on 46th Street and 17th Avenue in south Minneapolis. This year, the school has more than 300 students. a strategic plan for the Hiawatha Academies network to grow to 2,400 K-12 students in five schools, according to a news release from school officials. 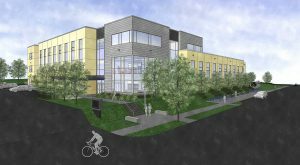 The high school will welcome more than 400 students when the school opens in fall 2018 and is expected to grow to nearly 800 students and more than 80 staff in the next four years, according to the release. The school also aims to have every student in its inaugural high school class graduate in 2019. Those students also will have the opportunity to finish their senior year in a brand-new high school building. for students, according to school officials. and an open area for the student commons. There will be dedicated classrooms for electives such as art and band. As the school expands, adding teachers to the new classrooms, staff will have new flexibility to teach electives in addition to required courses, said Cooley. give kids the classes that fit their strengths,” said Matt Toppin, dean of instruction. The project costs $27.3 million, school officials said. It is being financed with the help of several partners, both local and national. Students say they are excited for the new space, especially bigger lockers. One of those students is Heidi Sanchez Avila, a junior at Hiawatha Collegiate. Sanchez Avila was in band class last year and is eager to use the new space. To celebrate the renovation of the new high school, the school hosted a groundbreaking ceremony on Oct 25. Partners and students were invited to the ceremony.